May 8, 2015 (SSB) — “What is your name, Brother” is one of the questions I have oft-time encountered on social media. I would be chatting with some Junubeen and then invariably the question would pop up like some kind of ritual that must always be performed before the actual feasting commences. Apparently, the fact that someone called “PaanLuel Tong” is on-line chatting with them is not enough. Slowly, I have come to realize that a given name, to Junubeen, must first and foremost register your tribe for it to be real—for it to be taken seriously. 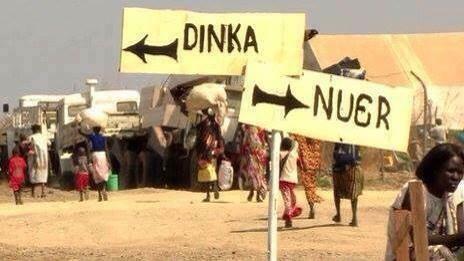 Because the “PaanLuel Tong” nametag does not automatically register a “Dinka”, “Nuer” or an “Equatorian” tribal identity in the mindset of most Junubeen, it has to be false and void. It is not the real name. In fact, under the current situation in our country, a name is a political statement, an alliance of some sort. To some Junubeen, Akot Manut is Salva Kiir and Alier Magot is Kuol Manyang. It is a death sentence in some quarters of South Sudan. To others, the names Tut Gatluak and Chuol Gatdiet are not just Nuer but also sufficient proof of rebellion by and of themselves. It was a death sentence between December 15th and 19th in Juba. Thus, “What is your name, Brother” is synonymous with “which tribe are you from, Brother” and must be addressed before chatting can progress. It is a search for the only known identity in the Republic of South Sudan: you are your tribe and your tribe is you, period. Your publicly expressed personal opinion is taken as the official position of your tribe. You speak for your tribe and your tribe speaks and even “eats” on your behalf. This is why the firing of a relative who has been enriching himself at the expense of the entire nation is reduced to “we are finished” in Juba. This probe of “what is your real name, Brother”, to me, touches on the vexing question of tribalism and national identity in the Republic of South Sudan. We all have our tribal heritage, a factor that can and does constitute one of the possible ways we can be categorized. For example, I am a Dinka by birth, but that is not entirely the only way my identity can be determined. It is not the only way I perceive myself in relation to my country mates. I am also a young man, educated in the West and currently in South Sudan. So my other important identities are my education, my gender, my age and my being in the West—as one of the so-called lost boys of the Sudan. To these world-wise lost boys, the politicians currently in power might seem to be illiterate old men with no experience in governance and leadership. Yet, my tribe claims a lion’s share of me. This is the daunting scenario addressed by Pastor James Machar. Speaking on Radio Miraya on Thursday, May 7, 2015, James Machar, a priest in the Episcopal Church of South Sudan, said that he is a Dinka as well as being himself—a male, a priest, a Juban, a young man etc. Therefore, in the current conflict, whoever has a problem with him as James Machar has a problem with James Machar only. However, whoever has a problem with him as a Dinka has a problem with over three million people. This is the genesis of tribalism in South Sudan, said Machar. We are the presumed ambassadors of our respective tribes. The same argument can be seen with politics. For whoever has a problem with Salva Kiir appears to have a problem with three million Dinkas; who has a problem with Riek Machar seems to have gotten himself into hot water with all the Nuer people; someone who has a problem with Wani Igga looks like he has a fundamental issue with the entire Equatorian region represented by three governors. Is it possible to have a problem with Kiir as just Salva Kiir, Riek as only Riek Machar or Wani as simply Wani Igga? The fact that one can be a male or female, young or old, extensively educated or barely educated, having been abroad or homegrown, a war veteran or a returnee, a SPLMer or Khartoumer does not count as much as being either a Dinka or Nuer or Equatorian or from the Minority group. Why is this the case? Why are our tribes taking a lion’s share of our national identity? After all, the national dilemmas we face today are not necessarily about tribes. The major issue, it seems to me, is the question of governance and economic development. Good governance is not determined by which tribe the leader comes from. It is by the level of education and life experiences and natural wisdom that determine the policies enhancing economic development. So in this case, one would think that education and possibly age (which, in most African societies, is equate-able to experience and wisdom) should be the main determining forces. But they are not, for being a Dinka, a Nuer, an Equatorian or one of the other minority tribes is more of a powerful statement to our individual and collective identity in South Sudan than, say, age, gender, education or political creed. For us to realize the goal of one nation and one people living side by side in peace, we must deal with the vexing question of negative tribalism. One intelligent way of doing just that might be to embrace the stark reality of our situation. Let’s embrace being Dinka, Nuer, Equatorian, and Minority communities. It is our African heritage. Let’s embrace tribalism. Embracing tribalism means officializing it. Officializing tribalism mean bringing it out of the black market where it is being abused. Let this new positive tribalism be called Tribocracy. But Mr Vice president, have we tried to save our economy before asking other countries to save it for us? Miss Amer Mayen Dhieu: Don’t Let Your Vision Be Blurred By You And Cynic!